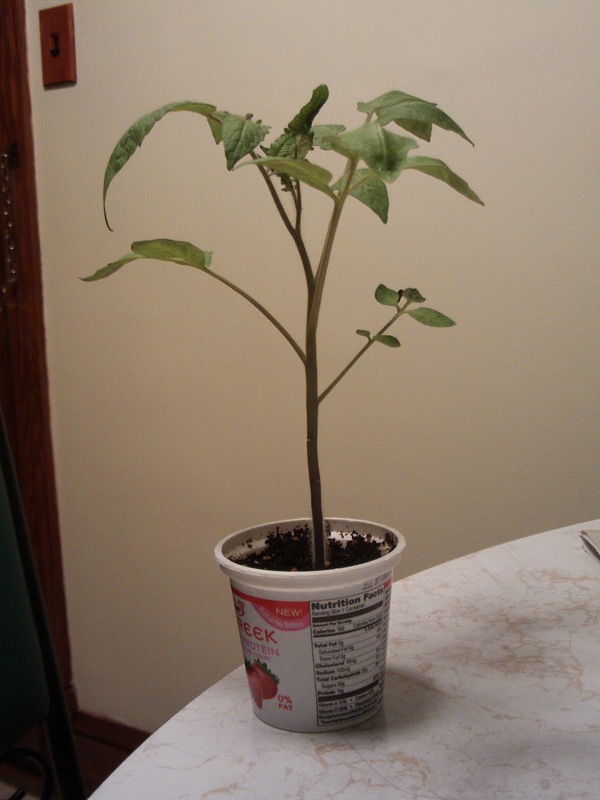 Every year, in late winter, I start my indoor transplant experiments. I used to start seeds in my basement, but determined that the ambient temperature wasn’t warm enough to support proper growth. So I challenged my husband, Nicolas, to build something we could use upstairs. 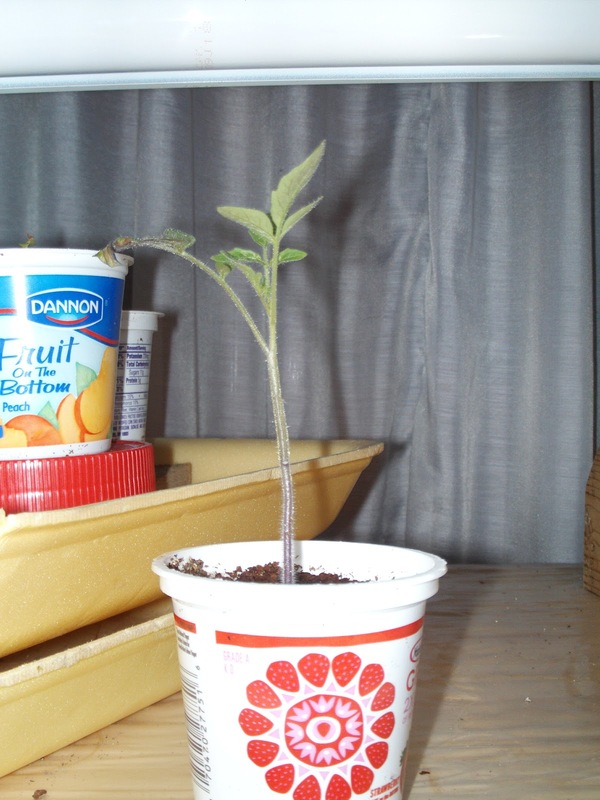 The result can be found on the Grow It Eat It page about starting seeds indoors. Nicolas’ set up is photo #12, by the way. Nice job, eh? Anyway, this year I started my seeds as usual, and all was going pretty well. But then I noticed that the peppers and tomatoes didn’t seem to be growing at all – and I know that peppers can be soooooooooo incredibly sloooooooooooow. I postulated that the temperature still wasn’t warm enough, though I’d had success upstairs in the past. Because of the warmer winter, the heat wasn’t on in my house as much as in the past, resulting in slightly cooler indoor temperatures – about 71 degrees, I found. So here’s where the experiment came in. I thought that this might not be warm enough for my babies, so I set up an incandescent light (they’re still good for something, right?) to shine on the plants for heat. The temps went up to about 78 degrees. Note: be careful not to set the lamp too close else you can burn the plants – I know from experience! I saved my babies! I’m confident that they’ll be good and strong when it’s time to put them outside in a few weeks. But not now, it’s still too cold outside! ← Carroll County Grow It Eat It Team Announces! Watch Out Aphids – The Lady Bugs are Coming, The Lady Bugs are Coming! Without lamp, the temperature near the plants is 68-71*F and that is when the sun is shinning outside with a facing south window. 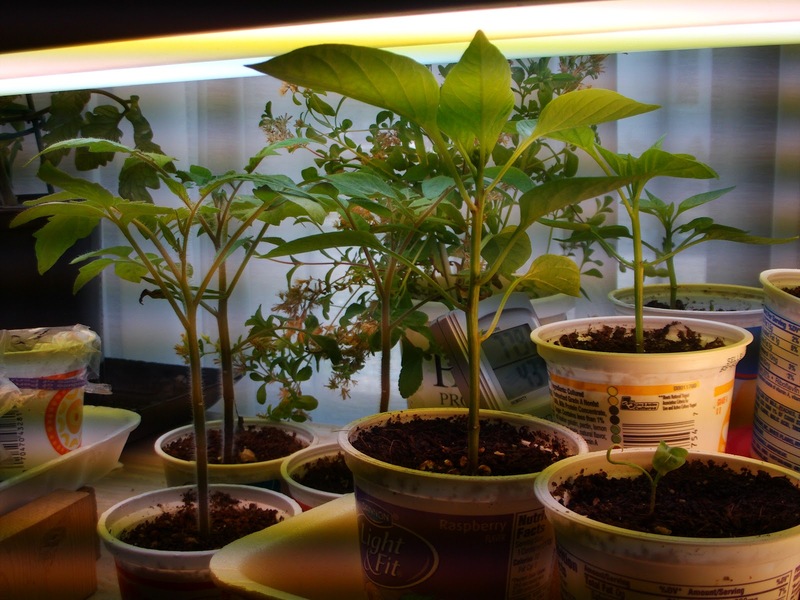 The lamps helps to keep the temperature near the plants 7-10*F above the interior temperature. You need to keep an eye on the temperature because if it's 70-80's degrees outside and sunny, the temperature near the plants can reach close to 90*F ! 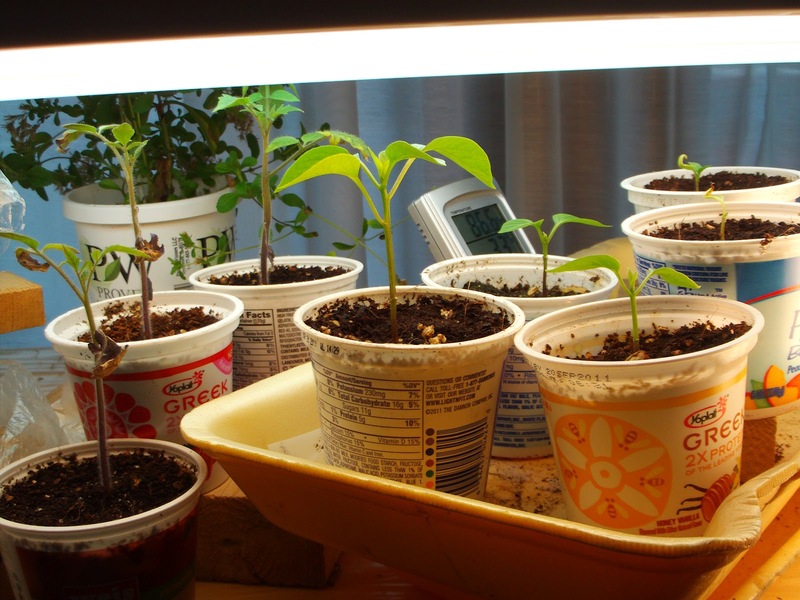 Playing with the distance between the lamp and the plants is the key to keep the plants happy with a temperature around 78*F.
I ran into this problem many years ago when starting peppers, eggplants amd tomatoes in my basement. These warm season vegetables like heat and according to the back of my Johnny's seed packs like to be grown at around 80 degrees. I solved the problem in my basement by creating an enclosed area for my florescent lights. I used half inch foam insulation with a 4 by 8 sheet as a door. It works great. The florescent fixtures are old T-12s that give off enough heat to keep the temperature in the box at around 80. If you look at the seed starting video I did for HGIC a couple of years ago, you'll see the insulated light box in the background. The things we do for our vegetables! 70 deg is too cold…95 is too hot…80 is JUST right. Hmmmm…interesting, because clearly in my case 70 deg was not warm enough. Those poor tomato plants sat there, not getting bigger, and turning yellow until I put them under the lamp. It's all a big experiment!! !